I cannot place the magic wand podium, it says its locked/ limited item, what do I do? You will have this problem if you try and place it from the new items tab, look in your inventory instead to be able to place the magic wand podium in one of your sims houses. After the time has passed come back and click the exclamation mark above your sims head to find one of the spell casting collectibles. Every time your sims complete one of the options above their spell casting hobby skill level up percentage will increase, once they reach 100% they will level up, there are 6 levels. You need to reach level 6 to be able to unlock all of the spell casting collectibles, once unlocked you will be able to find them. 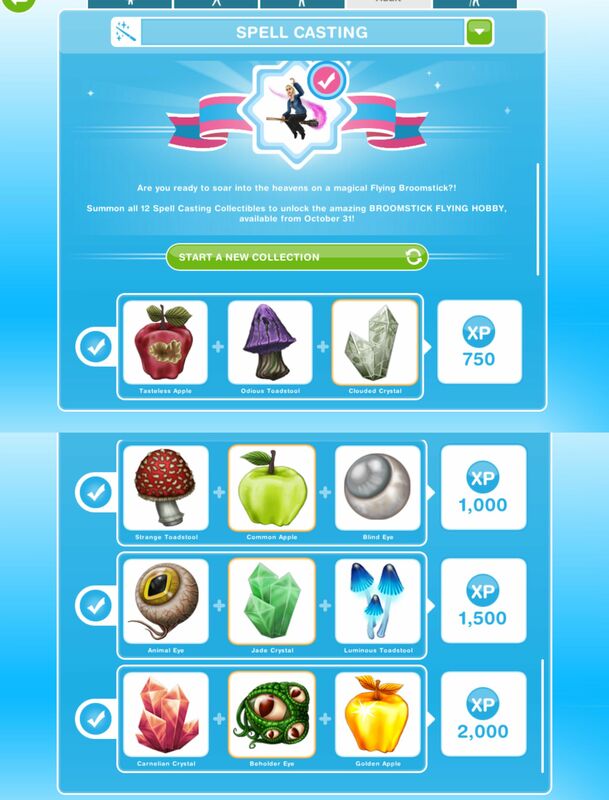 Wizard Luminous Toadstool, Beholder Eye and Golden Apple are now unlocked in the hobby collection. 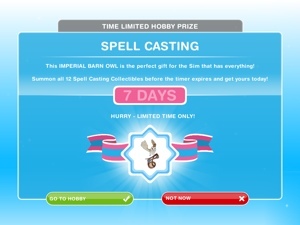 If you complete this hobby in the time limit you will unlock the Imperial Barn Owl, which can be found in the Sorcerous supplies store and pet section of the home store and costs 15LP. Disappointingly it is just like a wall decoration, I was hoping it would fly around the house! oh that is a problem I have no idea, sorry! Makes perfect sense 🙂 Thanks for the input! i have finished the book of spell quest and accidentally pressed not now for the spell casting hobby time limited prize… where can i start it again? just buy a podium and start the hobby. You are a very nice person! Helping everyone with all the quests and hobbies. Also answering stupid questions other people ask. Very patient and nice indeed. I wish I know you. I have one of those “stupid” questions. I’m doing the spell casting hobby and trying to get it done in time to buy the owl. A couple of times when I first started the hobby I got a pop up letting me know I could buy the wizards outfit for my sim. So is this just an advertisement or a suggestion? Does it help find the pieces faster or do you know? That is a good question actually! Do you think something is off with my game if I keep getting the same object? I’m a level 3 now and I’ve done the spell casting hobby 3 times–the 8.5 hour one and I get the same prize every time. Is that abnormal? Thanks! Where is the Spell Casting outfit for the adult female Sim? I looked in the costume store and it wasn’t there. After you purchase your 1 podium choose one sim for the next seven days to continuously do the spell casting. Now, send another sim to a “Friends” town on the party boat and try to find a podium there. If you find one put another sim on there and keep him doing the spell casting hobby. And that’s how you get two sims to do the hobby. Both sims will equally level up and double your odds. PS you’re better off spending the LP to finish the task quicker instead of spending it to roll the random dice to get the object you need. Hi! I am spellcasting as a hobby and received a popup that I should buy clothes for my new sorcerer. When I went to Home Store, the Hobby button is no longer there and I also went to her wardrobe to look and it doesn’t include the clothes there…? Am I looking in the wrong places?? Thanks! I received the outfit but only in one color. It shows a couple of different color costumes in the picture of the event. Are you only supposed to get the one color? Yes they are only available in one colour for a life stage, so the adult females is different to the adult males one. Firstly thanks so much for your blog, I would never had got so many lps without your help! So many great tips u are the best!! I hit not now for the spell casting hobby quests, and i dont know where to go to start the quest or get it back again. you just need to click on the spell casting podium to start the hobby. Hi !!! I’ve read a lot of the questions and comments so as not to repeat it again and again. (Wish others had.) You’ve provided a lot of help and it’s greatly appreciated. Now, my question. I’ve completed the quests for the Spellcasting hobby and the broomstick-flying hobby. I bought the podium and started Spellcasting. I went to cook dinner and it said I couldn’t do both hobbies of Spellcasting and cooking. No problem. Just eat at a friend’s house. Then I bought the flying broom closet and wanted to go for a ride. It said that I couldn’t do both hobbies to fly AND cast spells. How do I do both? The time expired on the Saved By the Spell quest and I couldn’t complete it. I have several things I and unable to do because of that. How do I bypass that? Once the time runs out you can still complete the quest, you just don’t get the limited timed prize. 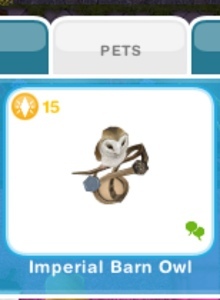 the owl can be found in the pet section of the home store like it says in the post. What does the owl do? I wanna know if it’s worth playing for. Hiya, I don’t know why but I just can’t find the last collectable for this hobby. I know I just have to keep going but this seems crazy slow, I tried desperately to finish on time, used Lps but nope and still nothing since, at this rate I think I’ll finish the fishing first! Any ideas? thanks for so much great advice, it’s really helpful. Unfortunately there isn’t much I can suggest, some hobbies just take longer than others to complete (designed so you use as many LPs as possible of course) so just keep at it, I know it is frustrating but you will get it one day, sorry! I’ve been working on completing the spell caster hobby for well over a month now….I was originally doing it over and over and only would get items up to level 5 so I thought I’d give it a break and now I’ve just been doing it randomly and still I can’t get even one level 6 item! My sim had been a level 6 wizard and it shows there unlocked I just feel like this has to be a glitch how could I literally never get any level 6 after almost 2 months of trying atleast 2 times daily! If I sell the podium can I buy a new one? At the risk of sounding stupid, I got the podium, but I can’t find it to start the hobby. ‘ you help? I knife my time is running already. Did you buy it from the sorcerous supplies store? You cannot use the one from the quest so you have to buy a new one from there first then you will find it in the hobby and careers items section of your inventory. Just started the spell casting hobby yesterday I’d only gotten the very first item (the rotten apple). This morning when I went on a message cam up saying that I hadn’t completed the hobby in time, and now it’s gone!? Have you heard of this happening to anyone before or do you have any suggestions? Accidentally sold spell casting podium now when I go to the sorcerers store its grayed out and says I can only buy I per town. Is there another way to buy a podium? Do you have a neighbour with a podium? If so you will be able to complete the hobby in their town, once complete you will be able to buy another podium in your town. Or you could contact EA to see if they can fix this for you. Weighlessmagic you have been very helpful. Upon reading you answered all my questions… I love Sims so much but this FreePlay version is so challenging I spend a lot of bucks purchasing VIP for the sake of Time Expentions but still as a busy man I cannot make it on time. Could there be anyone wants to be my neighbor? Its Tafalla1985. Thanks a Lot guys. God bless you all. You will just have to keep going unfortunately, there are no tricks to it, you will find it eventually.